This page lists and briefly describes each of the major patches to MapleStory since the Big Bang (which occurred ~10 years after the game's initial release). Starting with the Big Bang, major patches have been rolled out as themed groups of content, often centering on a new dungeon or class. The Big Bang is the first major game-changing update of MapleStory. It updates, alters and adds many maps, skills, and monsters. It was split into three patches. Part 1 updates nearly every map, monster and skill in the Maple World. Part 2 released the first of the Resistance: the Wild Hunter and Battle Mage. Part 3 brings the Mechanic. Chaos brought in part 1, adjustments to Aran, Evan and Dual Blade in which we also saw the return of the Dual Blade, including changes to stat enhancing items (potions, scrolls, etc.). Part 2 (The Technological Age/Age of Artisans) brings in 'Professions', it allows you to create items, potions and accessories and we also saw Black Mage's dream which took place in Henesys Ruins and Future Ereve and saw Empress Cygnus all grown up. Some items in the Profession system are exclusive to the Profession system. Part 3 (Super Fight) brings in PvP (Player vs. Player) and a whole load of new equips. In GMS, this was separated into 5 parts, part one included the Future Ereve/Henesys. Part four saw Ice Knight, a PvP mode and part 5 saw Capture the Flag, a GMS exclusive PvP mode. In JMS, the update was titled Renaissance. Part two brought the modified version of the Profession system. The UI for the Profession system is different and the fatigue is used up differently. Additionally, we saw the combination of the Smithing and Accessory Crafting profession and saw the Monster Tamer profession which ties in with another JMS exclusive update, Monster Familiars. Part 1, dubbed Counterattack of the Blade, included Warrior class adjustments and saw in Speigalmann's new quest, Monster Park! Part 2, dubbed The Spell of Awakening, added further adjustments to the Magician classes and update Monster Park and in KMS, saw MapleStory's 8th Birthday. Part 3, known as The Arrow of Speed, consisted of Archer class adjustments as well as new and revamped Party Quests. In GMS, the patch was not split up and was named Ascension. Here, we saw the Wedding Revamp which simplified the Amoria map and added incentives to stay married after a report that noted more than 50% of MapleStory marriages get divorced. In MSEA, the patch was split into two patches. Part 1, named The Arising of the Origins (Origins are referring to the original classes), which updated Warrior, Magician and Archer classes. Part 2, named The Amazing Monster Park, added the Monster Park quest, in addition we saw the Party Quest update. This big update brought in three new classes. The first update saw the Cannon Shooter (Cannoneer in GMS), a Pirate that uses a new type of weapon at the time, cannons, to defeat his or her foes. With high damage and low mobility, the Cannon Shooter is a powerful class. The second update saw the legendary hero who was awoken after centuries, Mercedes. This elf queen has been sealed for a few hundred years and has awoken to defeat the Black Mage, she uses a new type of weapon, Dual Bowguns. She's quick and speedy with moderate damage and low health, she's great for anyone with experience in Bowmans. The second update also saw a Profession update which raised the amount of fatigue and made it easier to level up your Professions, this update also saw a 20% speed boost to everyone. The third and final update saw the Resistance warrior, Demon Slayer. He uses one handed maces and/or axes to defeat his foes. He used to be a Black Mage commander and like Mercedes, he wishes to defeat the Black Mage. This update brought in a ton of new players into the Korean version of the game. In Korea, there was a time where there were about 700,000 people online, a record high whose record before the Legend update was around 400,000. The first update, labeled Advance of the Union saw changes to Aran and Evan classes and this also brought in Akyrum, a commander for the Black Mage. The second update, Alliance Unbound saw revamps to the Resistance class, Aran and Evan classes and saw a revamped Mu Lung Dojo, Ellin Forest, and multiple party quests such as Ghost Ship and Nett's Pyramid. The last update of the trio saw Cygnus Knight revamps and saw the revamp of the popular Lion King Castle. In GMS, these were in 3 parts. The first launched Aran and Evan changes and a revamped Silent Crusade with the new boss Akyrum. This update to Silent Crusade made a ton of changes to the currently existing system and some of which players were unhappy about. While also launching in this first update saw the return of Crimsonwood Keep PQ which was bugged for years after the Big Bang update. The second part saw more Aran and Evan revamps but also added in Resistance revamps which boosted some classes quite well. Coming in with this update also revamped Mu Lung Dojo (which now is a completely competitive quest), Ellin Forest, Nett's Pyramid (this update was significantly changed from the previous version, assumed to deter botters), Ghost Ship and it has also brought the Destroyed version of NLC and Nebulites (which are similar to the Potential system). The last update dubbed Alliance Eternal, brought in the first ever Cygnus Knight only revamps and saw the revamp of the popular Lion King Castle and turned it into a theme dungeon. Notably, the GMS version kept the "Party Play" system which in summary, allows players to gain extra EXP bonuses for each party member in party while in the maps due to player request. All the other versions had removed the Party Play bonus from the game. 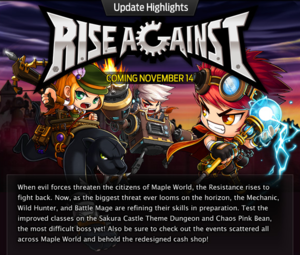 In MapleSEA, these updates are merged into one patch known as Return of The Forces. In EuropeMS, these updates merged with Justice and Tempest into one huge patch, named Tempest. Here, the first update brought the long awaited Thief and Pirate revamps, a Navigation system for helping beginner players get to where they need to go, a level-up guide so beginner players know what to do to quickly get to a higher level, minor changes to other classes, disabled PvP and made popular bosses such as Zakum, Horntail and Von Leon instanced. The second update brought Phantom, the Thief hero of the Maple World. The last update brought Aswan, an underground city that has been cursed by the Black Magician and allows you to defeat waves of monsters to help liberate the cursed souls. In CMS/TWMS/MSEA, we saw Dragon Warrior/Zen, an exclusive Pirate class to these versions. This also caused the Pirate revamp to be moved from the first part of the update. In GMS, this game update was dubbed Renegades. The first update brought in Jett, who is looking for Burke who assassinated and framed Jett for murdering the king of their home planet. Cerebus Rapid Action Force is now looking for Jett who crash landed into the Maple World and ended up in Nautilus Port. This update also brought in a few UI upgrades (level up guide, navigation system, etc.) and the long awaited Thief revamp. The second update launched the mysterious Phantom! The third update brings Aswan. The Pirate Revamp and Dual Blade Reorganization will be in the Mutiny patch. In GMS v118 (patch notes here), released at the end of September 2012, brought with it Warrior, Magician, Bowman, Cannoneer, Demon Slayer, Aran, and Evan revamps and leveling incentives for new players. It also re-enabled the creation of Cannoneer, Demon Slayer, and Mercedes characters. The latest release with a silver logo and a sooner release date. In GMS v121 (unnofficial patch preview here; official patch notes here) the three resistance classes, Battle Mage, Mechanic, and Wild Hunter, get a revamp. Battle Mages get damage, speed, and projectile distance increases. Mechanics can now change the color of their mech, they can use a secondary weapon called "Magnum", and they get damage increases. Wild Hunters can get a new mount, the Snow White jaguar named Jaira. They also get a new party buff and increased damage. 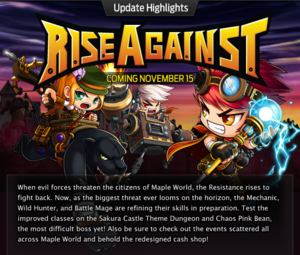 This patch also released Chaos Pink Bean, Sakura Castle (an official theme dungeon and the second version of Ninja Castle), a temporary re-release of Red Leaf High School, a Cash Shop revamp, and it started the Thanksgiving events for 2012. The first update dubbed Prelude to the Storm and it brought in lower requirements for job advancements and events. The second update is dubbed Choice of Light and Dark brought in the last Hero class, Luminous. The third update was dubbed Protector of the Dragons, Kaiser! launched the first class Kaiser of the Nova race, the hometown of the Novan race (Pantheon) was released with this update as well in July 26th. The fourth update was dubbed the Idol Of The Battlefield and was released on August 9th, this came the second Nova class, Angelic Burster. The fifth update, which was named Traitor Magnus, released on August 16th, launched a new boss named Magnus and a new area where he resides. The sixth update, which was named Beginning of the Evolution, Hyper Skills!, brought in Hyper Skills, which were new skills that could be obtained later in 4th job for which the skills add boosts in their previous job's skills, a few active skills and a buff that could raise the damage cap by 50,000. Only Nova classes and Hero classes got this, in a later patch; Adventurer Warriors, Adventurer Magician and Mihile received their Hyper Skills. See full patch notes, here. Job advancement levels lowered from 70 to 60 and 120 to 100 for jobs 3 and 4, respectively. Secondary stat requirements for equipment were removed. SP resets. Aswan revamp. Free Market map change. Character slots per server increased from 15 to 18. Luminous was released on December 5th, 2012 with version 124. Kaiser and Hyper Skills was released with version 125 on December 17th, 2012. For patch notes, see here. Angelic Buster was released with version 126. For patch notes, see here. Root Abyss was released with version 127 on January 16th, 2013. For patch notes, see here. Aliance patches, Justice and Champions were merged into a huge patch. Kaiser was released before Luminous, together with the lowered job advancement levels. Phantom was released on December 17, 2012. Unlimited was released on the KMS server on December 6, 2012. December 6 : The first update brings Additional Options, where items have a small probability to get additional stats on top of its normal stats. It will also bring a new maximum limits to stats for players. The bosses in MapleStory will be reorganized. December 20 : The second update brings Demon Avenger, a branch from the Demons, which players can choose either Demon Avenger or the usual Demon Slayer. Demon Avenger uses HP as a main stat. He does not have Demon Force. He uses Desperado (a new weapon) as a main weapon as well as Force Shield just like Demon Slayer. January 3 : The third update brings Xenon , a unique Resistance class that is a hybrid, which is a combination of a thief and a pirate. Xenon can wear both types of equipment. He uses an Energy Sword as the main weapon and the Controller as the secondary weapon. He needs a Hybrid Heart as a power source. He also uses 3 types of stats : STR, DEX and LUK. January 20 : The fourth update brings Monster Life, a Farmville-esque system to upgrade and add monsters to your farm. This also brought Root Abyss, a level 100+ area with four bosses and a quest line. MapleSEA began Tempest + Unlimited on April 24, 2013. The name of the update is Season2, changed from Episode 3. Champions, Rise Against, Tempest and Unlimited are merged into huge patches. The first part of KMS' Unlimited is released first before other updates. Demon Avenger is released first before other classes on May 15, 2013. Angelic Buster is released on May 29, 2013. Luminous and Kaiser is released simultaneously on June 12, 2013. Xenon will be released on July 2, 2013. EMS began Unlimited on May 22, 2013. The first part of KMS' Unlimited is released. Demon Avenger is released on June 10, 2013. Xenon will be released on July 24, 2013. Spark is an update that CMS, TWMS and JMS will receive. It brings a revamped UI, new areas to explore along with the rest of the Unlimited update. GMS called this update Unleashed and has been released in three parts. June 19 : The first update brought an increased level cap (to 250 a la Cygnus Returns), revamped skill, inventory, item and equipment UI, new places to explore (Twilight Perion, Twisted Aqua Road, revamped Singapore/Malaysia) and a new party quest (Alien Visitor). July 3 : The second update brought Xenon with level 160 'Terminus' weapons. July 24 : The third update released the Demon Avenger. KMS: known as MapleStory Cygnus Returns Striker, released on January 31st, 2013. GMS: known as Cygnus Awakening, released on September 5, 2013. v.141. Official update summary. The first patch includes the reorganized Striker job (Thunder Breaker in GMS), an increased level cap from 120 to 250, Chaos versions of the Root Abyss bosses, as well as the level 150 Root Abyss equipment set. The second patch includes a reorganized Wind Breaker, the newest area in Gate to the Future: Twilight Perion, and a large world alliance with some events released. The third patch has Soul Master (Dawn Warrior in GMS) reorganized, along with KMS' 10th Anniversary, a new chat system and an updated Cash Shop. MapleSEA released all of the 3 Cygnus Returns patches in one patch on August 7th. CMS released the Striker class August 7th. The fourth patch includes the reorganized Flame Wizard (Blaze Wizard in KMS) and an increased level cap from 120 to 250. The fifth patch includes the reorganized Night Walker and an increased level cap from 120 to 250. GMS: released in GMS on November 14, 2013. v.142. Official update summary. The release of Tynerum and Gollux. Hero, Nova, and Resistance class revamps. Hayato and Kanna hyperskills. Easy boss modes for Zakum, Von Leon, Arkarium, and Magnus. Stone Colossus dungeon. Revolution July 4: The first update brought an entire overhaul of the Explorer branch, free job changes and a Profession revamp. Evolution July 18 : The second update brought MapleStory's first dual character, Zero! The long awaited Auction House comes packaged with this update as well. Delight August 1 : The third update will bring Critias, a high level area. A 100:1 boss battle with Hecaton comes with it, Boss Monster's League, Boss Arena PvP and Commanders' Invasion. First Impact (v143): explorer/adventurer jobs revamp. Zero (v144): December 18, 2013. Release of Zero, new job. The first update brought all Heroes and the Resistance were reorganized with new skills and effects. A new jaguar for Wild Hunter was added, and Wild Hunters have the ability to switch between captured jaguars. Two party quests, Moon Bunny's Rice Cake and First Accompaniment have been world merged, meaning that all characters from different worlds can join a party. The Soul Weapon system was updated, with a new Soul Collector that documents all souls collected. The storage UI was updated. Mihile, Mechanic, Bowman, Demon Avenger, Demon Slayer, Wild Hunter, Thief, Mercedes, Kaiser and Evan all received small changes to their skills. The Lion King's Rose Garden was added, with new monsters and a continuation of The Lion King's Castle storyline. Two more party quests, Forest of Poison Haze and Remnant of the Goddess have been world merged. Changes to the user interface were applied. A new default keyboard layout was added. The new layout focuses on the QWER keys, similar to other games. Users can select the old or new layout in settings. A new button below the minimap allows users to quickly access features, such as Silent Crusade, the Bits System, Maple Chat and Boss Arena. Guild maximum level has been raised from 10 to 25. Guild skills use GP and IGP instead of mesos. GP skills for the whole guild while IGP skills only affects individually. Guild level is now based on the contributions from all guild members. 30% of the contributions are given to the guild while the remaining 70% will be given to the member as IGP (Individual Guild Point). The updates in the FLY patch were releasedthrough two different updates, unlike many other updates. These updates were not joined together with a single theme (like how KMS did this FLY patch) and were treated as different updates. This FLY patch was added in v148 and v149 which were the Grand Athenaeum and the Legacy of 9 updates respectively. Each character can be moved once. Up to 3 characters per world can be moved. You will not be able to keep your ranks for Mu Lung Dojo and Donation medals. Marriage, guild/alliance, buddy list, and repeatable quests will be reset. Your storage will not be moved. Your Cash Storage will be moved, unless you're an Adventurer/Explorer, then only Cash items in your inventory will be moved. A Chestnut Coin shop is released, allowing you to obtain scrolls, 10th anniversary equipment, and other goods. Coins can be obtained by events. The Honor and Ability system is revamped. Honor level is now removed, and the experience accumulated is shown below your abilities. You can now use your honor experience to reset your Ability, as well as locking the rank or any lines. Existing Circulators and Miracle Circulators will work the same as they currently do. Some existing content had required levels changed. Fight for Azwan, Spiegelmann's Gonzo Gallery, Ariant Coliseum, Monster Carnival, and mini dungeons have been closed temporarily. Zakum's prequests (Adobis's missions) are no longer required to fight Zakum. Chaos Zakum expedition has been removed; now you must enter in a party. People level 50 or higher can talk to their job instructor to be warped to The Door to Zakum. Easy, Normal, and Chaos Zakum now share entry times, and can only be entered twice a day. It now resets at midnight for all 3. The Buddy List has been revamped. The UI has a new appearance. You can now have people added to your buddy list on all of your characters, not just one (optional). You can choose to be invisible when you log in, meaning your friends will not see you as online. Victoria Island's taxi is free. Consumable boxes can now be put on quick slots. Enhancing with scrolls has been changed. You can now use Scroll Traces (found from hunting monsters or extracting scrolls) to upgrade items. The higher level the equipment, the lower the success rate and the more Scroll Traces used to upgrade it. The Rune system has been added, with Runes spawning randomly in fields. Your speed and attack speed will be increased. 10% of your HP will be healed, you will take 20% less damage from monsters, and you will gain 20% elemental resistance. Any enemies around you will be killed, and you will gain 50% extra damage for 2 minutes. The HP of monsters will be reduced by 10% and you will gain 50% extra damage for 2 minutes. Monsters and maps have been changed. The HP of most monsters has been increased 2 to 9 times, and the experience is increased by 1.2x to 4x. Due to this, certain instant kill skills have lower success rates. All monsters now give party bonus experience, ranging from 125% to 275%. Sometimes, when you defeat monsters, an Elite Monster will appear, becoming twice as large, and having increased HP, damage, and experience. It will drop rare to epic equipment, Cubes, Flames of Reincarnation, Golden Hammers, or Protection Scrolls. Sometimes, Elite Bosses will appear as well. All other monsters will disappear and a few elite monsters will appear when it spawns, and once defeated, a bonus stage will appear. These monsters will drop Rare to Unique equipment below 120 and some of the rewards mentioned for Elite Monsters. Monsters throughout Maple World have had their levels changed. Availability: GMS (June 24th, 2014). Changes: Skill changes, runes added, elite monsters and elite bosses added, mini-games added. Touch of the Coordinator: Star Force July 24: The first update brought a revamped equipment enhancement system, skill changes, revamped Evolution System and a ton of new equips. Shining Star August 28 : The second update brought a brand new game-wide "hub" for events and minigames called the Star Planet. Black Heaven: First Chapter September 30, 2014 : This update brought the first two acts of the Black Heaven storyline in the new Blockbuster system. Also, this patch included some more skill changes and there were some changes to Star Planet. Black Heaven: Second Chapter October 16, 2014 : This update brought the third act of the Black Heaven storyline in the new Blockbuster system. This patch also included some more changes to Star Planet, a new chat system and added Halloween events to Star Planet. Black Heaven: Second Chapter (2) October 30, 2014 : This update brought the fourth act of the Black Heaven storyline in the new Blockbuster system. This patch also brought a complete revamp to all the Resistance classes. Black Heaven: Final Chapter November 25, 2014 : This update brought the last act of the Black Heaven storyline in the new Blockbuster system. This patch also brought a new boss, Suu and new level 160 equipment. Though the next patch, Maple ICE & BURN were not part of Black Heaven, one of the patches brought forth a new area titled Haven that had to do with the Black Heaven storyline. Black Heaven: First Chapter March 11, 2015 (CMS: March 18, 2015): This update brought the first two acts of the Black Heaven storyline and the new Maple Talk system and Resistance updates. Black Heaven: Second Chapter March 25, 2015: This update brings the next act of the Black Heaven storyline. The official name for this update is <기승전12!> but this is almost untranslatable into something meaningful in English so the name that is accepted is from the KMS blogger Orange Mushroom which is "Creation 12!". The patch names are also taken from him as well. Introduction February 27 : Some previous events were re-introduced. FriendsStory: Rock & Roll: March 10 : A new chapter to Friends Story was added, Rock & Roll. The SEED R: March 26: The SEED R, an updated version of The SEED which has updated stages, rewards and rankings. Xerxes of Chryse Party Quest which is level 75 - 120 will be available beginning April 2nd. Conclusion : Return of Legends changes and 2 new characters are introduced into the Star Planet PvP. 1st part of the patch includes Skill Rebalances (where most jobs are getting nerfed while weaker jobs are buffed to achieve near-perfect balance) and Battle Stats system to keep track of damage output. Damage increase when attacking bosses’ has been renamed to ‘Damage increase when attacking boss monsters’. The 2nd part of the patch includes the Hyper Stats system, the Reboot world (no reliance on NX cash) and the Toad's hammer system (carry over up till Epic Potential Stats to an equipment up till 10 levels higher, bonus stats does not carry) as well as Monster Changes to Mu Lung, Time Temple and Future Ereve. 3rd part consist of Dojo revamp and new job Kinesis. 5th part consist of the massive 18 man raid Urus. This page was last edited on 1 September 2015, at 11:53. This page has been accessed 158,004 times.